When that unpleasant chill hits the air, it's time to get tips on how to keep your skin hydrated in the wintertime. Dryness can be uncomfortable, and it's important to defend yourself against the elements to maintain skin smoothness and suppleness all season. Keeping skin hydrated and beautiful in colder weather calls for both internal and external care. Slathering on lotion is not the only solution for your dry winter skin. In fact, the lotion you apply during the rest of the year might not be effective during a harsh winter. The following tips offer you alternatives that can keep your skin softer and smoother. The old saying "you are what you eat" holds true when it comes to your skin. Moisturizing your body with the right nutrients from the inside reaps huge rewards for the way your skin appears on the outside. You can also take a fish oil supplement to ensure you are getting enough of omega-3 fatty acids. Health.com suggests taking a supplement that contains 180 milligrams of eicosapentaenoic acid (EPA) and 120 milligrams of docosahexaenoic acid (DHA) three times daily. Drinking enough water to keep hydrated is just as important during the winter. It helps your body functioning well, keeps you healthy, and your skin hydrated. Try to maintain a habit of six to eight glasses of fluids a day which can include water and unsweetened drinks. This is a good defense against the cold, dry, wintry air and will supplement other skincare advice. After an afternoon on the slopes or an evening of making snow angels, you may want to soak in a hot bath or stand in a hot shower to get warm. Doing this warms you up but may also dry you out. According to the Mayo Clinic, hot water breaks down the lipid barrier that protects your skin's surface. This makes it easier for your skin to lose its moisture. Take warm or lukewarm baths and showers instead. Joyce Carboni, licensed esthetician and director of Skinsational Spa in North San Diego, reminds us that "To help repair skin, avoid over-washing in the shower, since soap and hot water can strip skin of its natural oils." Additionally, "make sure to apply a layer of moisturizer right away to lock in moisture." Humidifiers add moisture to the dry air inside your home. This dry air is a major source of dry skin problems during the winter. Leave it on every winter night and your skin will reap the moisture benefits while you sleep. During the summer, it is important to exfoliate dead, dry cells from the surface of your skin. You don't need to do this as often during the winter. Once a week or once every two weeks exfoliation is sufficient to help keep your skin surface smooth and avoid damaging it. Joanna Vargas, senior aesthetician at the Tracie Martyn Salon in New York, recommends a cleansing and exfoliating facial at the start of winter. This can help to correct some skin hyper-pigmentation that occurred from sun exposure during the summer. Pat your skin dry with a towel and leave it slightly damp. Immediately seal in that dampness by gently massaging a moisturizing lotion or body oil all over. If your skin is exceptionally dry, you can apply a coat of a rich body cream after a few minutes. Colloidal oatmeal: Aveeno Moisturizing Cream is a good choice as a healing moisturizer for dry, itchy skin, including your face. Natural oils: You can choose from a number of moisturizing oils including shea butter, sesame, olive, argan, safflower, and coconut oil. Some thick soaps and moisturizing cleansers are also infused with these oils. Essential oils: Mix a few drops of essential oils such as lavender or chamomile with unscented baby oil. Apply all over, except your face, to get a good night's rest and lubricate your skin. Apply a hand cream such as Curel Advanced Therapy, which contains a moisturizing blend of Monoi oil, soy milk, and vitamin E.
Before going to bed, apply a rich moisturizer to your feet and pull on a pair of socks. Use an exfoliating treatment like GlamGlow's PoutMud Lip Exfoliating Treatment once a week to remove dead skin from your lips. Avoid scented lip products or lip stains that have ingredients that can dry out your lips. Tuck a lip balm in your pocket for quick lip relief on the go. Apply the serum first so it penetrates your skin. Wait five minutes, then apply your regular moisturizer. During the night, you can use a rich, oil-based cream if you prefer. Apply facial moisturizers once in the morning and once at night for best results. In addition, a mineral water facial spray, like Evian, or rosewater, provides a pick-me-up throughout the day. A standard recommendation is to protect your skin from damage by applying a sunscreen when you are outside in the sun. This advice applies equally to the winter months. Decrease your risk of skin cancer and signs of skin aging such as wrinkles by using a sunscreen of at least SPF 30 when you go out during the day. 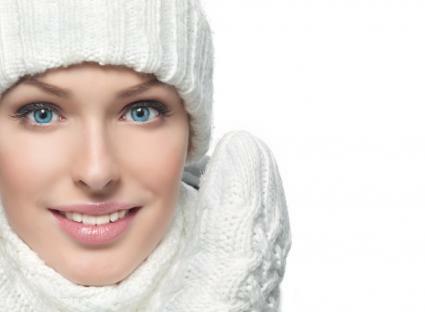 Though it can be more difficult, you can keep your skin glowing during the winter. By following a few simple tips and lifestyle practices your skin can stay healthy, hydrated, moisturized, and looking dewy and beautiful all year.